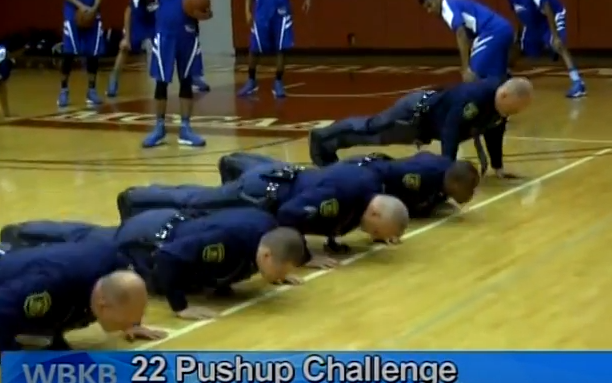 Michigan State Troopers were at the men’s ACC basketball game Saturday taking part in the 22 Push Up Challenge, the challenge is to raise awareness for veteran suicide. The number 22 represents the number of veterans who take their life daily. Inspired by his own son, who is suffering from PTSD, challenge organizer, Cal Howard said it’s all about helping people who are dealing with pain. “We’re finding that 22 veterans are committing suicide everyday. That’s a big statistic. When I looked at that I thought, ‘What could I do to help?’ So I basically formulated the coordinator for Northern Michigan and we’re basically trying to get the awareness out that it’s not only about veterans, it’s about anybody committing suicide. If you can help a person that’s going to commit suicide that’s the best thing you can do. Get them help, give them a phone number or something to get them in the right direction,” Howard said. The number is sadly increasing. Howard said the number of vets dying daily is now 25. “The sad thing is I just heard that the number has gone up to 25, and that’s really sad. Whatever I can do to help these veterans like my own son, I want to do that. I want to make a difference. If you can make a difference and maybe help a life from being snuffed out that’s what it’s all about,” he added. Howard plans to take his challenge to other cities in Northeast Michigan. He also said he hopes to reach the entire state of Michigan in the future.